Medical marijuana is legal in California, although sellers still aren't safe from the feds. Nor, apparently, are they safe from ninjas. On March 23, a delivery man reported to police that he had been robbed in West Covina, California, after making a delivery to a local patient. (Oh, by the way, in California you can have pot delivered.) According to police, as the man was returning to his vehicle "he was approached by two subjects in ninja costumes who chased him with batons." The victim claimed he was sufficiently frightened by the sudden ninja assault that he dropped a bag with some marijuana and money in it. The ninjas grabbed it and disappeared into the night. My master demands your cannabis! 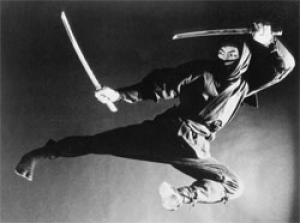 The duration of this chase was not reported, nor was it clear why these ninjas were armed with batons rather than something more ninja-appropriate (see above). And while I can't say I know anything about how the pot delivery system works, it seems a little odd for a delivery man to still have the stuff he was supposed to be delivering while on his way back from delivering it. Seems inconsistent with the whole concept of "delivering," in fact. I suppose it's not like pizza — maybe they let people sample it. I don't know. In any event, I guess the story is at least plausible, given the number of freelance ninjas running around out there, but in my experience these guys are at least as likely to fight crime as to commit it. See, e.g., "Mugging Outside Ninja School Goes Poorly," Lowering the Bar (July 24, 2010); "Amateur Ninjas Say They Were Sending 'Message to Drug Dealers," Lowering the Bar (Aug. 25, 2008). I assume it wasn't these knuckleheads, who are almost certainly too stupid to hold a baton. In this case, police said they were "not aware of any other recent crimes involving suspects dressed as ninjas." At last report the ninjas were, unsurprisingly, still at large.